NETWORK FINALS: Saturday was another night with NFL Preseason games, so there were plenty of adjustments. Each show in the ABC and FOX line-ups as well as DATELINE and 48 HOURS dropped 0.1 in final numbers, while both of the final hours of DOUBT fell 0.3. CABLE HIGHLIGHTS: There was another Saturday win for A&E’s LIVE PD, up 0.04 from last week to 0.67. NFL Network’s Preseason game was at 0.56. (HBO followed its usual practice of listing theatrical movies as “originals,” giving it 0.53 for “Fantastic Beasts & Where To Find them”.) Adult Swim’s animated line-up was mostly down from last week: DRAGON BALL Z steady at 0.39, the primetime DRAGON BALL SUPER up a tick to 0.32, JOJO’S BIZARRE ADVENTURE down 0.03 to 0.31, TOKYO GHOUL down 0.05 to 0.27, HUNTER X HUNTER down 0.03 to 0.26/567K, LUPIN THE 3RD down 0.05 to 0.19, NARUTO down 0.05 to 0.21/501K, GHOST IN THE SHELL down 0.01 to 0.17/389K, ATTACK ON TITAN down 0.02 to 0.17/365K, and SAMURAI JACK down 0.04 to 0.13/299K. On Disney Channel, ELENA OF AVALOR was at 0.32. The events in Charlottesville naturally prompted high viewership for cable news, led by CNN NEWSROOM in the 10PM hour at 0.32/1.4M, with Fox News’s AMERICAN HQ in the 4PM hour at 0.26/1.5M, and MSNBC in the 7PM hour at 0.25/1.3M. Hallmark’s original movie SUMMER IN THE VINEYARD was at 0.28. Nickelodeon’s JJ SIWA: MY WORLD was at 0.28. On Spike, COPS rose 0.06 to 0.27, and GONE was up 0.06 to 0.19. On Food Network, KITCHEN AT FN ticked down to 0.2, and PIONEER WOMAN was at 0.22. 7. On HGTV, HOUSE HUNTERS dropped 0.02 to 0.26, HOUSE HUNTERS RENOVATION lost 0.03 to 0.25, and BEACHFRONT BARGAIN HUNTERS was down 0.02 to 0.24. ID’s FATAL VOWS was at 0.24. 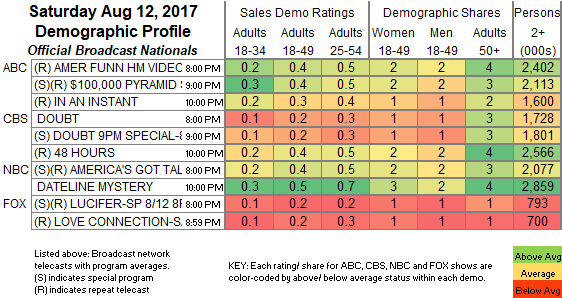 The series finale of AMC’s TURN climbed 0.03 to 0.15, and the series finale of BBCAmerica’s ORPHAN BLACK had a 0.05 bump to 0.13. 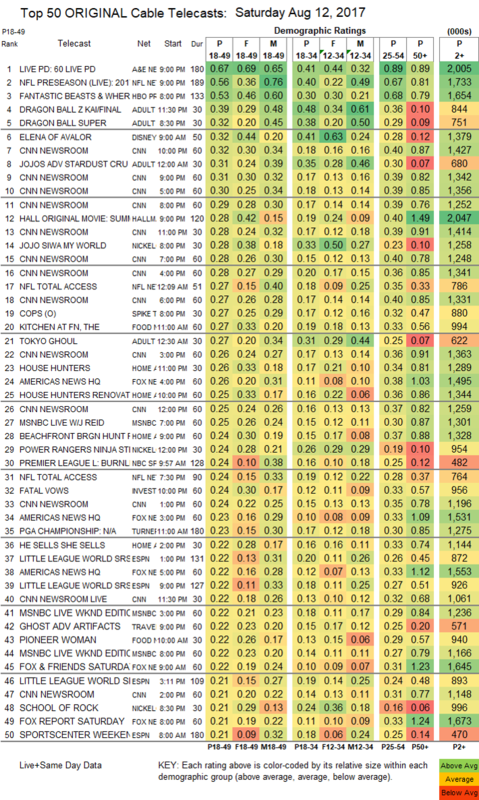 On OWN, LOVE THY NEIGHBOR was at 0.13/0.13, compared to last week’s 0.11/0.10/0.09.